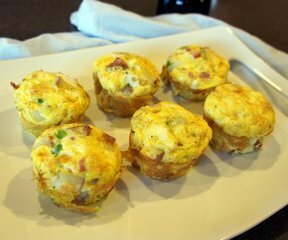 A tasty, easy breakfast dish that can be garnished with salsa for more zip. 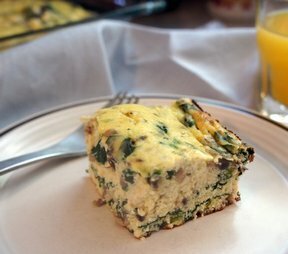 This Italian Frittata contains eggs, bacon, cheese, and mushrooms to get your day off to a great start! Search the site for more breakfast recipes to start your day. 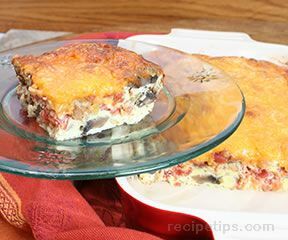 Prepare baking dish by coating it with cooking spray or butter to keep the frittata from sticking. In a bowl, whisk together eggs, milk, salt, oregano, and pepper. Pour the mixture into prepared baking dish. Sprinkle the mixture with sliced mushrooms, onion, and bacon. Top with cheese and fresh oregano. Bake uncovered at 350ºF for 25 to 30 minutes or until done. Check doneness by inserting a knife in the center; if it comes out clean, the frittata is done. Serve warm. If desired, garnish with tomato sauce or salsa.